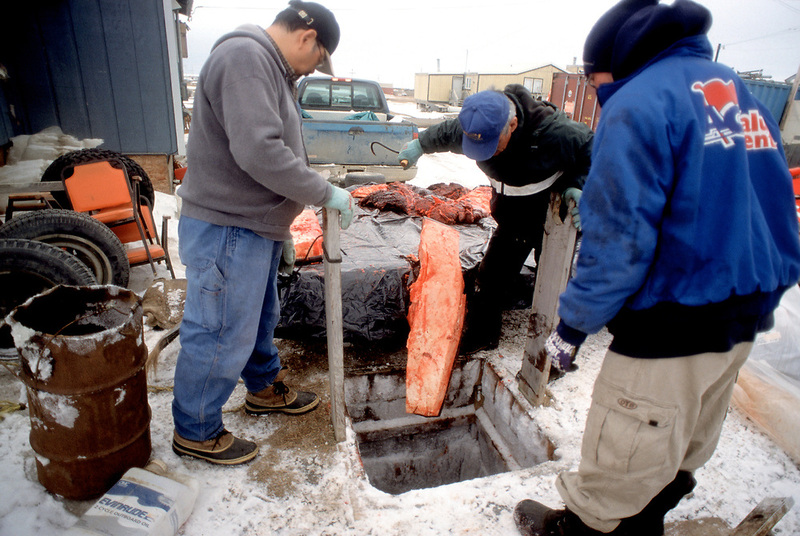 After the serving feast, the crews goes to the ice cellar to store the meat that will be used it the near future. Most of it will be served on Nalukatak, the feast held on summer by the successful whaling crews. Relatives from all over Alaska come during Nalukatak time. The ice cellar is a natural freezer since the soil is permafrost (permanently frozen). The tunnel can be up to 25 feet deep and the room at the end about 9X9X7 feet. Max Ahgeak pulls the ladder out after Price Itta went in.John Nageak hooks a piece of muktuk and Tristan Takkpak stands by.